Molecular dynamic simulations were performed to determine the elastic constants of carbon dioxide (CO2) and methane (CH4) hydrates at one hundred pressure–temperature data points, respectively. The conditions represent marine sediments and permafrost zones where gas hydrates occur. 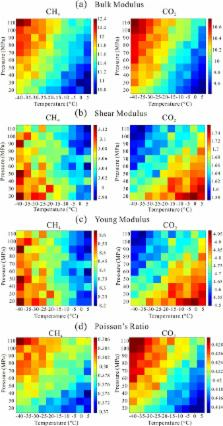 The shear modulus and Young’s modulus of the CO2 hydrate increase anomalously with increasing temperature, whereas those of the CH4 hydrate decrease regularly with increase in temperature. We ascribe this anomaly to the kinetic behavior of the linear CO2 molecule, especially those in the small cages. The cavity space of the cage limits free rotational motion of the CO2 molecule at low temperature. With increase in temperature, the CO2 molecule can rotate easily, and enhance the stability and rigidity of the CO2 hydrate. Our work provides a key database for the elastic properties of gas hydrates, and molecular insights into stability changes of CO2 hydrate from high temperature of ~5 °C to low decomposition temperature of ~−150 °C. GROMACS 4: Algorithms for Highly Efficient, Load-Balanced, and Scalable Molecular Simulation. Molecular simulation is an extremely useful, but computationally very expensive tool for studies of chemical and biomolecular systems. Here, we present a new implementation of our molecular simulation toolkit GROMACS which now both achieves extremely high performance on single processors from algorithmic optimizations and hand-coded routines and simultaneously scales very well on parallel machines. The code encompasses a minimal-communication domain decomposition algorithm, full dynamic load balancing, a state-of-the-art parallel constraint solver, and efficient virtual site algorithms that allow removal of hydrogen atom degrees of freedom to enable integration time steps up to 5 fs for atomistic simulations also in parallel. To improve the scaling properties of the common particle mesh Ewald electrostatics algorithms, we have in addition used a Multiple-Program, Multiple-Data approach, with separate node domains responsible for direct and reciprocal space interactions. Not only does this combination of algorithms enable extremely long simulations of large systems but also it provides that simulation performance on quite modest numbers of standard cluster nodes. Molecular dynamics of the frame-shifting pseudoknot from beet western yellows virus: the role of non-Watson-Crick base-pairing, ordered hydration, cation binding and base mutations on stability and unfolding. Chemical shift changes and line narrowing in 13C NMR spectra of hydrocarbon clathrate hydrates.